Finding the right weed wacker on a market full of options can be quite the task, but it doesn't need to be an exhausting task. While there are some good Echo vs Stihl trimmer reviews out there, we thought it'd be a good idea to include a roundup review of some of the other great brands in the market in ElectroSawHQ's weed eater section. Thus, today we'll take a look at some of the best electric weed eaters reviews on the market, including the best cordless string trimmer and the best corded electric string trimmer. 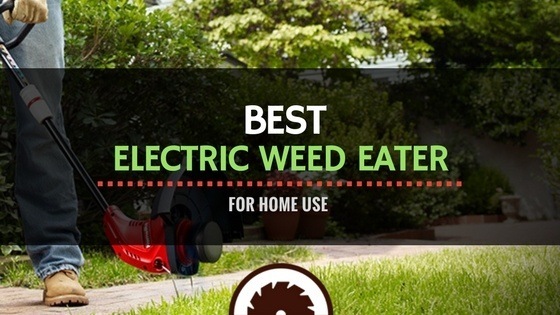 Here are some things to consider in your search for the best electric weed eater of 2018, whether it be cordless or corded. Each section below acts as part of a buyer's guide for the reviews further in the article. There are several tips to think about when deciding on which trimmer to choose. First and foremost, the type of material being trimmed and cut needs to be considered. Depending on the thickness or density of certain grasses and weeds being cut, one trimmer might perform better than another. For example, a battery-powered trimmer might be great for trimming around fences and poles in the yard, but it might not hold up to tall weeds and brush. A second thing to consider is noise restrictions. Some cities and neighborhoods have restrictions on certain noise volumes, especially during certain times of the day. Therefore, certain weed eaters will be ruled out completely based on the amount of noise they produce. In order to figure out what kind of noise levels these electric weed eaters generate, asking customer service about decibel levels can be crucial. When it comes to picking out an electric weed eater, there are a few aspects of picking from. First and foremost, consideration needs to be made about how long the cord on the trimmer is (if it requires such for electrical access). If the cord that comes with the trimmer is not very long, then in most cases, an outdoor extension cord is needed to complete the job. Depending on the size of the yard being cared for, the trimmer might need a much longer extension, which adds to the cost of the trimmer overall. Therefore, users are restricted depending on how long of a cord they can find. If a yard reaches beyond a few hundred feet, then these cords might not be worthwhile. At the same time, the noise level of a corded weed trimmer is rather loud in comparison to some cordless models. However, they will last far longer than the cordless variety. Additionally, the string release on these models is much easier than they are with their battery-operated counterparts. Not much manual adjustment is needed for use. However, there is a downside to using these corded trimmers outside during bad weather. Depending on the type of storm at hand, these trimmers can cause electrical sparks during heavy rain. Cordless trimmers, on the other hand, can be moved around freely. Battery-powered string trimmers just need to be fully charged before a job. While you won't need to worry about tripping over power cords, they also have a few downsides. Most batteries (exclusing Lithium-Ion batteries) only last about 15 to 20 minutes at a time. For people who have larger yards, this situation might not be ideal. Therefore, paying close attention to the size of the yard being cared for is probably the best indicator of which weed eater to choose. The best battery-powered weed eater will end up being quieter than some corded models, but they short-change users on the amount of time they can be used. A few batteries might be needed to power through certain yard sizes, and waiting for the batteries to charge over time can be a pain. Therefore, a person needs to be willing to test their patience and do a larger yard in sections before completely finishing it with a cordless trimmer. Once the battery in these trimmers dies beyond the chance of no longer holding a charge, they need to be disposed of properly. Most of these batteries are lithium-ion-powered, so they cannot simply be thrown away in the trash. They have to go through a specific recycling process before they are completely gotten rid of. Additionally, replacing these batteries incurs a decent cost over time – one that would not be present with the purchase of a corded electric trimmer. As far as weather is concerned, the weather will certainly place a damper on whether or not these trimmers can be used. Just because a cord does not exist does not stop the fact that these trimmers are electric. Therefore, they should not be used in wetter weather. Check this article to compare the electric and gas-powered weed wackers we've reviewed. Here is a closer look at the five products mentioned above. Each one provides an in-depth look into the product being considered. Black + Decker's LSTE523 model works both as a trimmer and a wheeled edger tool. Therefore, it is quite the multitasking tool. It also has a power drive transmission, which permits it to produce more torque. This is arguably the best battery-operated weed eater. Therefore, this model is quite the powerhouse, considering it works on battery power. For people who are fans of Black + Decker's 20V Max power tool line, they are likely to enjoy using this trimmer as well. It uses the same battery as those tools, so it is an easy add-in for people who use the product line. However, people who are new to the 20V Max line might be a little off put by the fact that this trimmer runs on batteries because of the power usage limitations. Also, batteries are not included with this trimmer, so they need to be purchased separately anyway. The feeder for string on this trimmer is part of Black + Decker's EASYFEED line. In short, instead of bumping the trimmer against the ground to feed out more wire or to clean it off, a button is pushed. Therefore, the process becomes automatic, saving users time and preventing damage from being done to the undercarriage of the trimmer. Remington's RM115ST Lasso operates as a corded electric trimmer. It works both as a trimmer and an edger, meaning it accomplishes more than one task. The straight shaft measures 15 inches in total. The edging wheel provides fast and easy trimming that leaves behind an even trim line, which makes it ideal for smaller yards. The engine's 5.5 amps are great for cutting grass, but it does not stand up to taller, thicker weeds. It also has an 180-degree rotating handle that makes for efficient trimming. The 14-inch shaft mentioned previously automatically releases for storage purposes. A button is used for the release mechanism. This ego string trimmer requires a line that measures 0.065-inches, which is rather durable for its intended use. The shaft on this model also telescopes to adjust for users of different heights. Remington provides a two-year, limited warranty for this product as well. The cutting width also measures 14-inches, which is far wider than most other trimmers. Furthermore, it includes a large debris guard to deflect clippings along the way. This feature can save people from kicking up rocks and hurting themselves in the process. Green Works is known for making lightweight products, and their 21212 corded string trimmer does not fail to appease lawn workers. This trimmer works great at trimming grass, but it does not hold up as well for long-term edging purposes. This trimmer only weighs a little over five pounds, so it cannot withstand a lot of powerful force. Therefore, the power cord chart provided with the tool should be followed closely. It has a 13-inch cut path with a 0.065 dual line auto-feed. The auxiliary handle is also adjustable to a person's individual height needs. Because of its electric design, this trimmer will start up right away, unlike with gas models that take a few more moments to get going. A power cord is not included with this model, so one will have to be purchased separately. Additionally, this trimmer will handle small to medium yards, so purchasing the right cord is essential in understanding how much ground needs to be covered. DEWALT is another brand known for making high-quality tools. Like the Black + Decker model, this ego 56V brushless string trimmer works on a 20V Max lithium ion battery. Therefore, it will only work for as long as the battery lasts. For people with larger yards, they might want to have more than one battery at the ready and fully charged. For people who are fans of DEWALT's battery-operated power tools, this addition is a logical choice. Instead of using 0.065 line, this model uses 0.080 dual lines instead. It also has a bump feed instead of an automatic option. The cutting swath is 13-inches wide, which makes it a little smaller than other items on this list. It does have a variable trigger with speed control. The gear drive made for this trimmer is patented in design by DEWALT. WORX operates as a corded electric variety instead of a cordless, battery-operated trimmer. This weed eater has a 15-inch cutting swath, the largest on this list. Therefore, it can cut through larger yards and thicker weeds with ease, and in a faster time frame. The motor puts out 5.5 amps of power, which is more than enough to perform trimming and edging. This two-in-one weed eater is a great addition to any lawn care tools a person might need because of the speed it uses alone. It does have four positions for the head adjustment, which makes it great to use on edging for sloped areas. This trimmer also uses a dual line, but instead of relying on the pump mechanism, it uses an auto feed process instead. Therefore, the feed refills faster and without risking damage to the trimmers under carriage. Considering the lightweight of this trimmer – it only weighs about 6.5 pounds – it accomplishes a lot of lawn work. This trimmer measures 4.9 inches by 9.5 inches by 38.6 inches in total. While five of the best models have been reviewed thus far, there is one, the distinct winner among the lot. In short, the WG119 Electric Grass Trimmer with Tilting Shaft, 15-Inch by WORX was saved for last on the list for a reason. This trimmer offers all the best features for being a lightweight, and it does not require much power. It will outlast any of the battery-operated models for sure. When it comes to meeting all of the advantages of a corded trimmer, this model certainly meets those requirements. At the same time, it can be used for larger yards, especially ones that have a lot of outdoor fixtures and delicate landscaping.